zella said purple: got valentines? so you can love people you didn't know before." quote from class group of young-fives discussing school, friendship and valentines. delivering home-made valentines to school-made valentines bags = literacy, art, family, friends, sharing, giving. 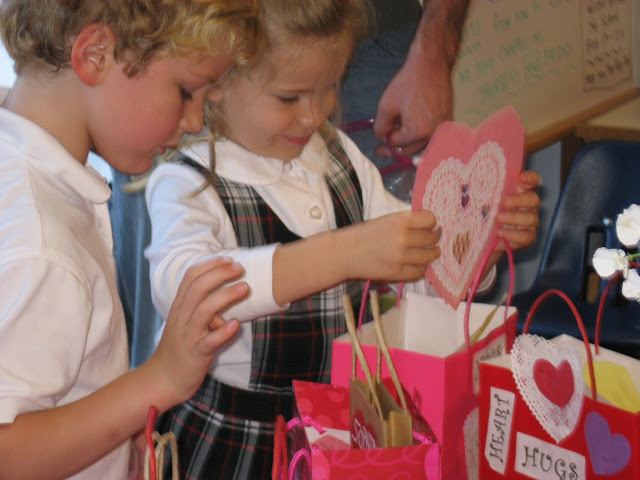 Valentine's Day is a special holiday for many schools. 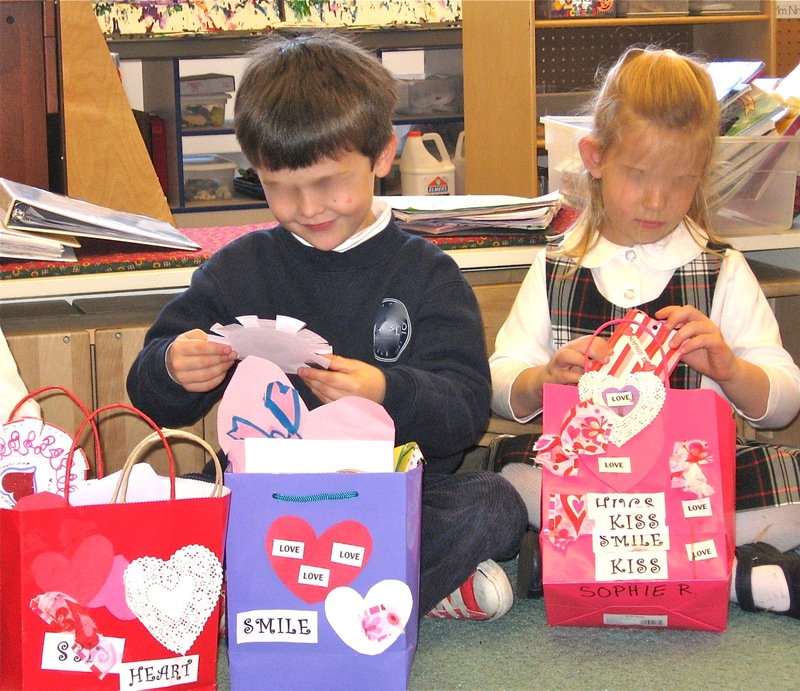 When I was in my long-term position as Young Fives teacher, we created a special tradition around Valentine's Day to incorporate literacy and art from home AND school. 1. HOME made valentines. All about choice and inclusion. one friend delivers his home-made card to me! We'd make sure to start the planning of this at least 2 weeks ahead - not too soon that it got set aside, yet not too time-scrunched for parents. We sent home a printed BOLD list of all names from our class - this included children, teachers, pets at the time (yes, we would have a Valentine Bag ready for our fish or rat !) and any other significant member of our class group. The bold list could be used at home to copy from when writing or even to literally cut out and glue them onto their work. Maybe via store bought commercial CARDS (some children super love Hello Kitty or Star Wars or whatever - that's fine!) with the child signing their own name. *We encourage no candy so that we focus on literacy + art. We'd have the completed cards arrive the morning of Valentine's Day in a zippy bag for safe keeping til the children would pass them out mid-morning. "I think this is the right bag for this card I made..."
2. Meanwhile AT SCHOOL, we would decorate sturdy, open topped, handled party bags. Use decorative, colored papers in traditional (pink, purple, red) colors and non-traditional (yellow, brown, orange) colors. Could have pre-cut hearts (for convenience) as well as stencils and scissors for children to design and cut their own hearts. Doily papers (lace-like cut papers), silver foil, gold stickers, be creative. These could be donated by families or purchased from your classroom budget. Super cool addition is COMPUTER PRINTED, LARGE "LOVELY" WORDS to glue onto their bags if the children choose. Word ideas include: KISS, LOVE, HEART, HUGS, SMILE. I tended to use shorter words so they would take up all the room on their bag. We found gorgeous holiday paper napkins that we would cut or tear to use pieces all over the bags. Blank papers for children to write their own words or messages to glue on. Special envelop with heart sticker for each friend around our Valentine Mail Table! ADMIRATION and MATCHING and READING. Also part of the process. When children brought in their bag full of cards on the morning of Valentines, I would make a special point of admiring their heavy bag or wanting to peek inside at their hard work :) The children would save their cards in their cubbies til we did our Special Valentine Delivery late morning. At morning meeting, we'd talk about the work we did and try to explain to our friends what we did for our collection and how they might identify our cards later. Admiring the process of CHOICE and HOW MANY DAYS OR HOURS it took to make these collections is important. Children begin to see how everyone did their own work and how we collectively come together to share and celebrate. 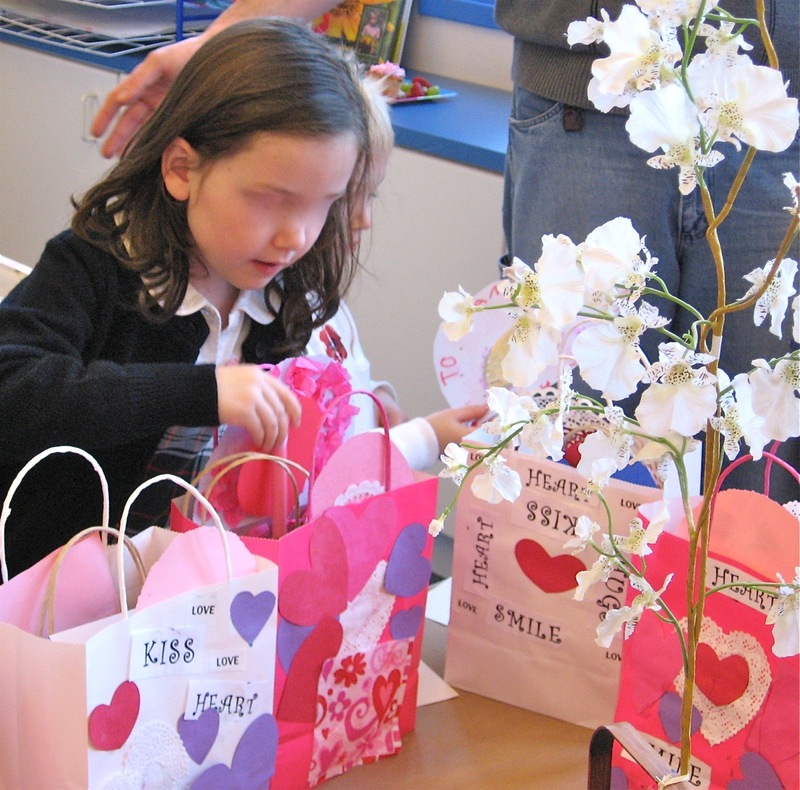 When we DO pass out our Valentines, we had a big table set up with our school-decorated bags ready to filled. We'd put our school big name card in front of our bag for easy finding and matching. (Our name cards are an integral part of our good morning times as well as our early writing experiences. You can see my name card a couple photos above - all children have one just like it.). Children take turns with a partner to pass out their cards while other children are in the choice time in the classroom. This allows for everyone to have their own time - long or short - to match up their cards to the bags on their own or with some support from teachers. The children playing in the room know they also get their own turn without being hurried or bumped around. When we are all done, we ADMIRE the bags so full on the table and bring our bags to our meeting area. 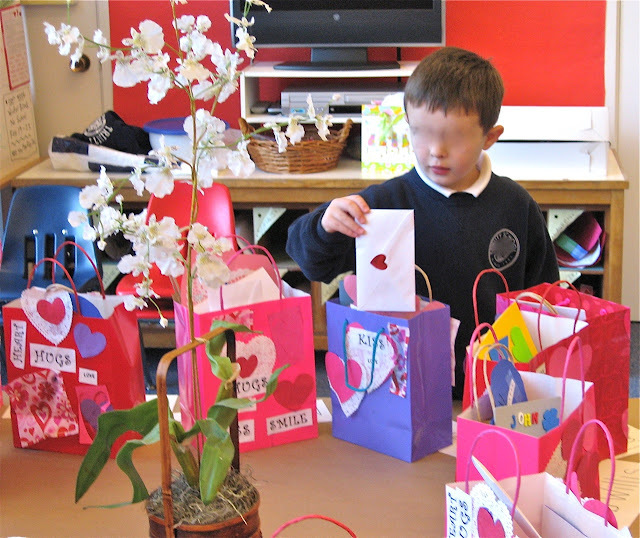 When the children are reading through their Valentines, they are admiring each others' work, trying to read or guess who made which one, seeing stickers or art or envelopes. It is a special time to model how to look close, to give attention to work given by others, to appreciate effort and friendship. 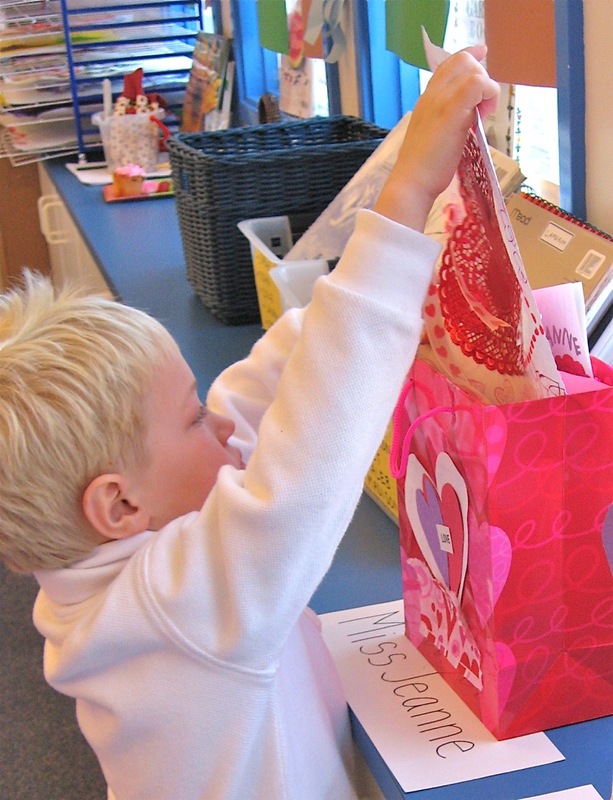 Can you see the boy is smiling as he admires the Valentine from his bag? A very special moment. The bags go home happily with the children at the end of the day. The guardians' faces light up when they seen ALL the children walk out of the classroom with their hands holding tightly to their colorful, love-filled bags of Valentines. Don't you just love Valentines Day? Stephanie - glad your husband enjoyed the opening quote :) Thanks for your thoughtful reply about the deep bonds we have/make with children - so special!